If you’ve noticed your Max & Miles Phalaenopsis Orchid has lost its blooms -- don’t panic! Orchid bloom loss and orchid dormancy are part of the regular life cycle of your orchid, when it rests between bloom cycles. Flowering plants don’t flower all the time, they need to take a break and rest before reblooming. This is most easily seen in outdoor plants during the course of the year. Flowers bloom in the spring and summer, and then need to wait out the colder seasons before reblooming again. 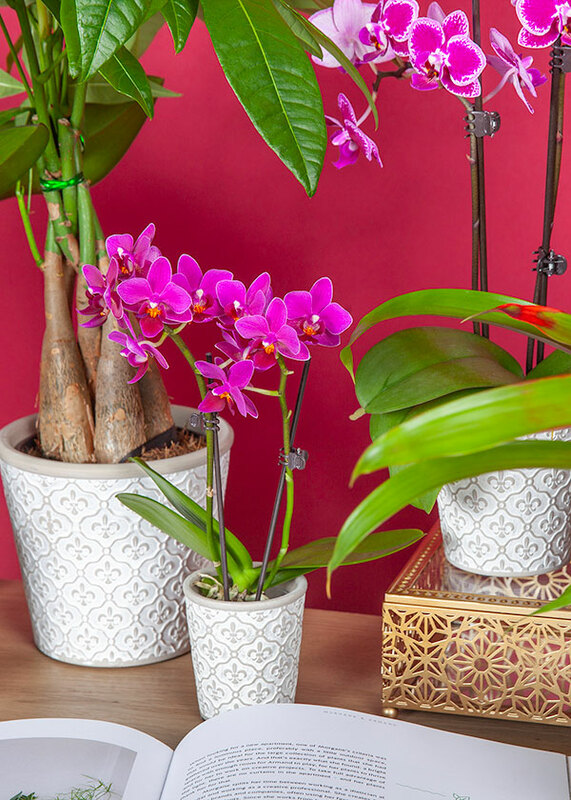 With your indoor orchid, however, you need to create a fake winter to trick your orchid into reblooming! With a little TLC, your orchid can indeed bloom again and keep coming back! What Does Orchid Dormancy Look Like? When your orchid goes dormant, it will drop its blooms. You’ll see them start to droop a bit first, and then they will fall off, usually one or a few at a time. You can pull off fading blooms yourself to help preserve the others while your orchid is still in bloom. You’ll also notice the stem and leaves of your orchid change during dormancy. When it’s going dormant, the green stems of your Max & Miles orchid will start to dry out and become shriveled. The leaves become more flat and limp rather than perky and upright, and they may appear more dull in color (but still green). First, don’t rush. Dormancy typically lasts six to nine months, and your orchid may rebloom all on its own! But if you want to help it along after it goes dormant, just follow these steps. Fertilize. As soon as your orchid goes dormant, start fertilizing it every other week to help rebuild its nutrient stores for blooming again. Use a balanced 20-20-20 houseplant fertilizer diluted to half strength. Do not water your orchid on weeks that you fertilize. Move your orchid to a cooler environment, between 55-65 degrees fahrenheit until a new spike emerges from your orchid plant. This helps simulate a “winter” season and tricks the plant into blooming to reproduce. Return the plant to its usual spot in your home once the new spike grows, and go back to watering with three ice cubes per week. Just like your orchids, it’s important for YOU to get the rest you need. While you’re waiting for your orchid to rebloom, how can you focus on self care too?